My most amazing niece, Emilie Hughes, posted something on Facebook recently that stuck with me: “People need to stop expressing their opinions when they don’t know the facts,” she said. “If you want to seem completely ignorant, by all means, say what you want. If not, then either research what you’re ranting about, or save your uneducated opinions for something else.” A few days later she posted, “I see humans but no humanity.” She’s 17 and very much has her finger placed firmly on the pulse of post-modern society. Her opinions resonated in me, her 51-year-old uncle. You see, I’m not politically correct but neither am I politically savvy—I’m woefully ignorant of all but the most rudimentary understanding of most political issues. As such, I tend to keep my opinions in those areas to myself. I’ve always been “the quiet one,” preferring to keep my mouth shut when it comes to piping up in a meeting at work, in a workgroup at church, or when the conversation turns toward politics at a party. I can talk to you all day about my Christian faith and about the Bible. I can jabber on about writing and gardening and raising a child in the way she should go. But ask me a question about the Constitutionality of the recent “laws” passed that violate not only basic morality but also the foundational principles on which this country is founded, and I act more like someone suffering from either disfluency or intermittent explosive disorder rather than a man confident in the truth of 2 Timothy 1:7. Oh, I can rant and rave, but I usually reserve the projectile vomiting of my caustic political opinions for my patient and loving wife in the privacy of my own home, especially over a glass or two of wine. But, as Emilie so eloquently pointed out, most of these opinions, while formed within a framework of moral truth based on Scripture, the Natural Law, a conservative worldview, and middle-class upbringing, are not based on any deep research or substantive contemplation. On the contrary, like many people on social media, I’m quick to spout off an opinion based soundly on emotional fluff and ignorance. As the moral fabric of this country has unraveled steadily over the past several years, my deepening cynicism (a rite of passage for those of us over 50) has driven me toward bouts of low-level grumbling between fits of guttural vocalizations and fist raising at my computer, especially when perusing Yahoo! headlines. Tired of bumbling around in political darkness and relying on internet sound bites to keep me informed of world events, I announced to Mary not long ago that I wanted to become more informed in preparation for the upcoming election. Yesterday, as I wound down the day at the office, Mary called me. “I have a Jesus thing for you,” she said. She related how a man had walked into the laundromat where she and Hannah were washing dog beds and dog towels. The man, tall, trim, gray-haired, told her he noticed the New River Fellowship window sticker on our car. He introduced himself and said he was with an organization called the Parker County Conservatives. Recognizing God’s light kick in the booty (especially since Mary has only gone to the laundromat once in the last 11 or 12 years), I sucked it up and went. “You know how when you go to a matinee,” Pastor Blair began, “and you walk out of the theater after the movie and the sun blinds you when you walk outside? You close your eyes and you blink a few times, then you can see clearly? That’s how this presentation is going to be. It’ll be enlightening.” And indeed it was. In an hour, Pastor Blair, former Chicago Bears offensive tackle and leader of Reclaiming America for Christ (RA4C), re-educated the audience about how this country was formed, who formed it, why it was formed, and for whom it was formed. 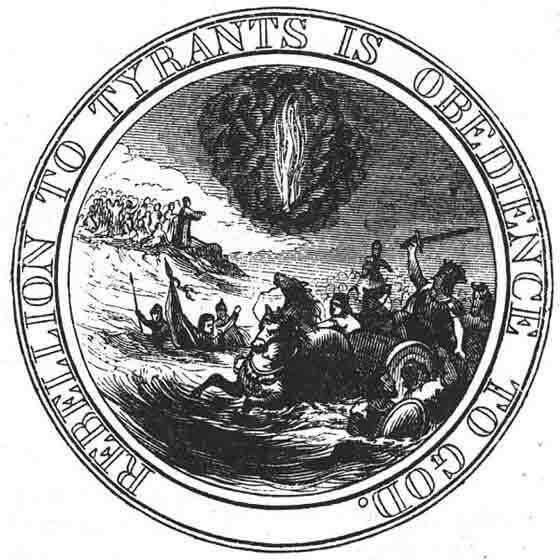 One of his first slides displayed a proposed design for the Great Seal of the United States developed by Benjamin Franklin: “Rebellion to Tyrants is Obedience to God.” The seal depicts a scene straight out of Exodus 14:28, with Moses standing in the background stretching out his arms while the Red Sea claimed the Egyptian horsemen and chariots. He explained that the United States of America is a union of sovereign states that delegated few and carefully defined powers to the central government. He reminded us how the federal government is composed of three separate branches—legislative, executive, and judicial—the weakest of which is the judicial branch, which was formed to interpret the law and provide opinions, not to govern, and especially not to impose governance solely by those opinions. He explained that the Constitution, finalized 11 years after the Declaration of Independence was penned, clearly outlines the powers of Congress in detail (Article I, Section 8). This list is very short. All other powers to make laws are left to the individual sovereign states. “Did the government send bombing runs against Colorado and the other three states that have legalized [recreational] marijuana?” Paul asked. “No.” So why are the states taking the opinion of five Supreme Court justices as law, as the rule of the land? “Who rules?” Pastor Blair inquired. “Kings rule. Not five lawyers appointed, not elected, to the Supreme Court.” For almost two centuries this country stood on the Bible. We were not ashamed of it. But in 1962, 1963, 1973, and 2015 the Supreme Court’s opinions became the de facto (but not legal) “law of the land.” Take God out of public school and all hell breaks loose. Literally. We’ve been overrun by it. The State of Oklahoma, through its Protect Life and Marriage program, is moving forward toward nullifying the Supreme Court’s edict in the recent Obergefell vs. Hodges case. Other states, including Texas, are joining the movement to open eyes to the insidiousness of the power grab going on in Washington, DC and restore the moral base upon which this country was conceived, nurtured, and matured (see www.protectlifeandmarriage.com). With opinions, possession is more than nine points of the law. It is next to impossible to dislodge them. Institutions which one generation regards as only a makeshift approximation to the realization of a principle, the next generation honors as the nearest possible approximation to that principle, and the next worships the principle itself. It takes scarcely three generations for the apotheosis. The grandson accepts his grandfather’s hesitating experiment as an integral part of the fixed constitution of nature. Throughout his talk, Paul continued to remind us of this apotheosis described by our 28th president. But the pastor’s presentation was not meant to bum us out but to raise hope and to inspire continued and even greater involvement. As Irish political philosopher Edmund Burke said, “All that is necessary for the triumph of evil is that good men do nothing.” For too long we’ve stood back, crossed our arms, and have done nothing. Like Sarah Palin quipped, “How’s that hopey-changey stuff working out for ya?” Education brings enlightenment; education in the Truth brings hope. After last night’s “chance” meeting, I think my hope has been restored, or at least it’s been sparked again. And that’s enlightening.